We take it for granted today that millions of Americans will get involved in every presidential election and in the campaigns for Congress. And getting involved means not only working for our candidates, but also contributing to their campaigns. This is true for both political parties and across the ideological spectrum, from conservative to liberal, Right and Left. We consider this a natural arrangement in a democratic republic. It was not always so. Until the 1960s, presidential politics in particular were the province of the elites in both parties. Candidates were chosen in those famous “smoke-filled rooms,” not primaries, and only the rich and well connected contributed to the campaigns of the chosen—who, of course, were then beholden to their financial benefactors. Each of the two major parties had about 25,000 contributors, which meant that roughly 50,000 donors determined the presidential choices in a country of 180 million. All that was left for the average citizen was to vote for one of the two choices given to them by the elites—0.0003% of the population. That all changed in 1964. Conservatives, demanding “a choice, not an echo” of the liberalism that dominated both parties, staged a grass-roots revolt and nominated Senator Barry Goldwater of Arizona as the Republican standard bearer, defeating New York Governor Nelson Rockefeller. This story, and the growth of the conservative movement that followed, is told in my book America’s Right Turn: How Conservatives Used New and Alternative Media to Take Power (co-authored with David Franke). Order it here. The Goldwater campaign established conservatives as a significant but minority political force in the United States. Something more was needed if we were to make conservatism a permanent, and ultimately majority, force in American politics. As indicated by the subtitle of my book, that was the use of “new and alternative media” to overcome the liberal bias that dominated the mainstream media, then as now. And the first of these new and alternative media was direct mail. Direct mail—reaching the individual American through the mailbox—was not unknown in the country. Even in the 1960s, direct mail was an established industry in America and offered businesses a way to sell directly to consumers. Sears, Roebuck and Co. had become a corporate giant and trendsetter by putting its catalog into mailboxes all across America. Reader’s Digest had become the world’s largest magazine and print publishing empire by utilizing direct mail advertising. What remained to be done was to apply those same techniques to politics in a systematic way. Even before 1964 direct mail had been used occasionally in politics. It was used sporadically, though, on an ad hoc basis, not systematically to build a movement. When I became responsible for running Young Americans for Freedom (YAF) in 1961, including raising money, it didn’t take me long to discover that I really didn’t like calling on people and asking them face-to-face for money—the established way of raising money back then. Asking over the telephone wasn’t much better. I found that I had a knack for writing letters, though, so that’s what I concentrated on. I learned from the giants of business direct mail, and from my own experience, what worked and what didn’t work. I went into business for myself, with YAF as my first client in January, 1965. Mailing lists are the lifeblood of any direct mail campaign, and I created my first mailing list by having workers compile the names and addresses of contributors to the 1964 Goldwater campaign, which were on file with the clerk of the House of Representatives. Within a few years, I had 1 million small dollar conservative donors and today we have 10 million. I used those lists to fund many of the organizations that became the conservative movement. I took the financial risk in the mailings for my clients, and in return kept a copy of the donor names and addresses for use with any of my other clients. In this way I created a “common market” of conservative donors that built a movement rather than just one organization. All of this was hidden in plain sight. The establishments of both parties, as well as liberal activists, weren’t interested in what I was doing. Then the Republican Party woke up. They hired two of my executives, Wyatt Stewart and Steve Winchell, who used my techniques to grow the GOP donor base from around 25,000 in 1977 to about 2 million in November 1980—a phenomenal accomplishment. I used direct mail to appeal to conservatives, they used it to appeal to Republicans—two distinct but mildly overlapping universes back then. The establishment had no clue about how much we had grown using direct mail—until the pivotal elections of 1978 and 1980. When Ronald Reagan won the presidency and the GOP captured the Senate in 1980, largely through our combined efforts in building activist and financial support through direct mail, the rest of the political world woke up and took notice. Over the years I used direct mail to help grow the conservative movement and to help create the New Right and then the Religious Right. Direct mail was joined by new forms of alternative media in the late 1980s and 1990s that could bypass the liberal lock on mainstream media—talk radio, cable TV, the Internet, and social media, and I utilize most of these—but direct mail still produces over 90% of all direct marketing income for conservative and liberal organizations. By the year 2000 there were probably 5 million contributors to conservative causes and campaigns, plus around 2 million contributors to the Republican Party, almost all of them solicited by direct mail. We’ve come a long way from the days when smoke-filled rooms and a mere 50,000 contributors controlled national politics, and the people were mere spectators. Next: How the Left now beats us in grassroots activism and fundraising, and what we must do to defeat them and save the nation. 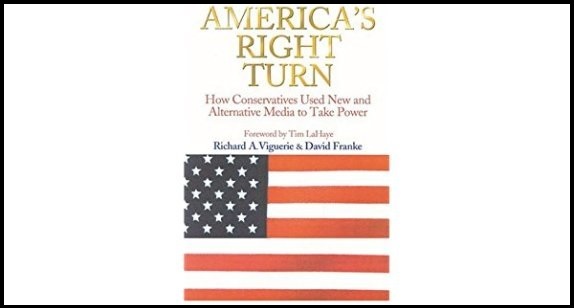 And for the full story of “how conservatives used new and alternative media to take power,” read America’s Right Turn. Order it here.